When I first heard that a new Vietnamese restaurant was opening nearby, I immediately googled their menu. Why? Because back in 2011 I began a search for the best banh mi in Los Angeles, and the hunt was still on. After a quick scan of their website, I discovered two important things: They serve banh mi for lunch, and they serve banh mi for brunch. 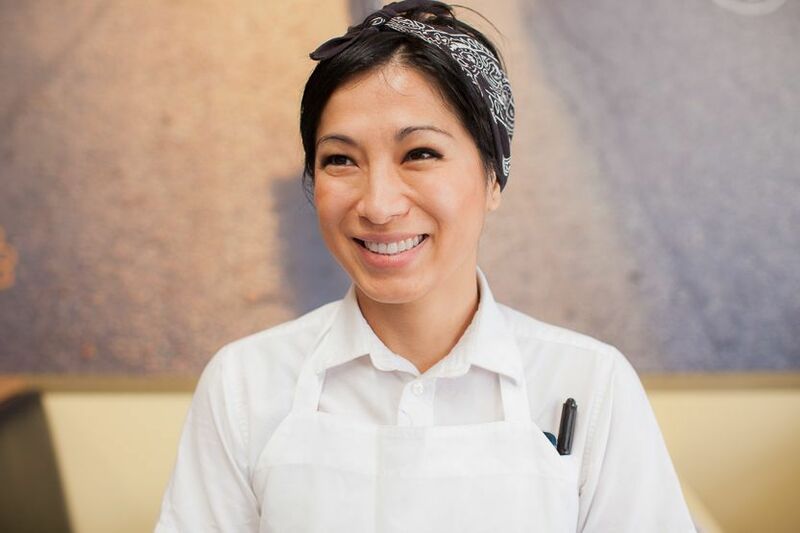 As far as I was concerned, East Borough and Chef Chloe Tran were already off to a great start. 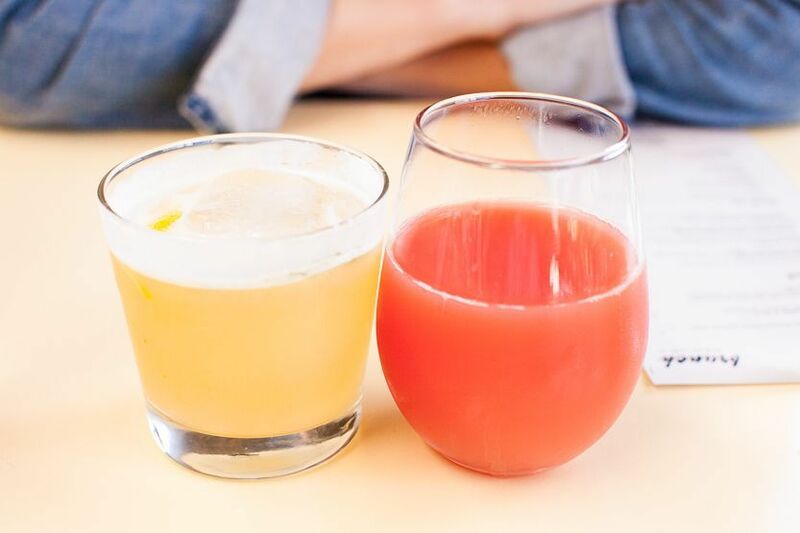 I sat down that Sunday morning at a pale yellow table in their new chic Culver City location. Immediately I was impressed by their fun cocktail menu and their $10 bottomless blood orange mimosa. I chose The Golden Axe, a mixture of rye, dry vermouth, ginger, lemon and mint that was strong and refreshing, while my friend opted for the mimosa. The brunch menu was brief yet enticing with unique twists that caught my eye. But I knew what I wanted: their breakfast banh mi with soft scrambled eggs and dark soy sauce. I chose a grapefruit lemongrass salad with spice chicken and thai basil to start and my friend ordered the very popular pho baguette that is served with beef brisket and a side of pho for dipping. Everything was excellent. 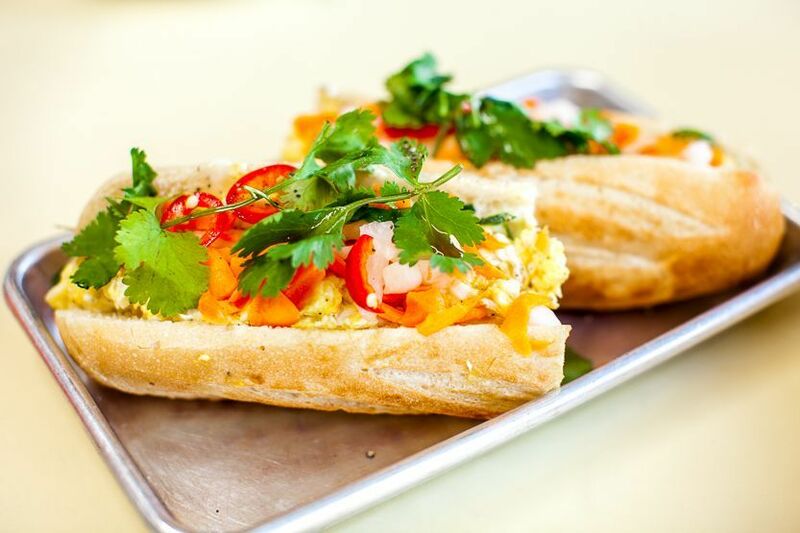 From the open atmosphere to the execution of all dishes, we were in banh mi brunch heaven. Though I usually prefer tofu in my banh mi, the scrambled eggs were soft as promised and a nice change to my usual order. I look forward to trying the tofu next time. However, if you don’t like crunchy baguettes filled with pickled veggies, fresh cilantro and spiced meats, or $10 bottomless mimosas, this may not be the place for you. But as far as I’m concerned, East Borough’s banh mi is winning. The Golden Axe – rye, dry vermouth, ginger, lemon, mint and a blood orange mimosa. 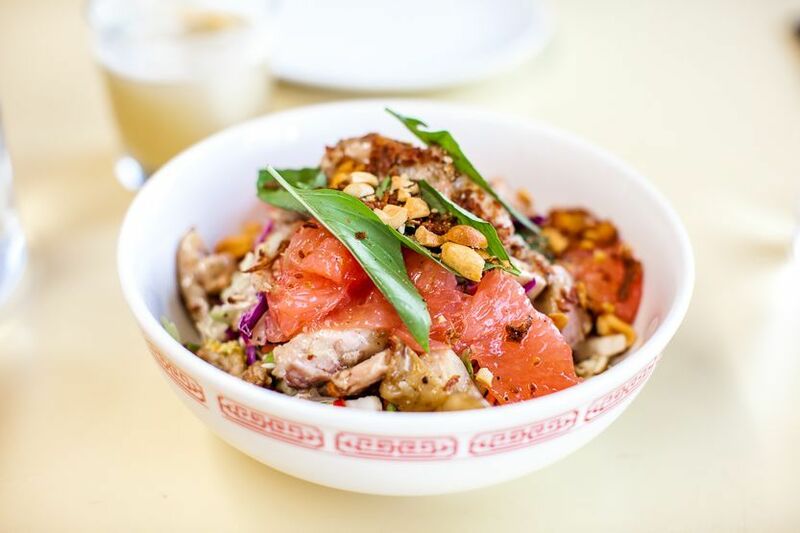 Grapefruit lemongrass salad with sau (6) spice chicken, red & napa cabbage, thai basil, cilantro, carrots, peanuts, fried shallots, nuoc mam. Very flavorful and refreshing, a must try. Soft scrambled egg banh mi with soy sauce. The right amount of pickled veggies and cilantro gave this sandwich a nice vinegar kick. Sold. I’m going to try for lunch today! Thanks!